TRENTON, New Jersey (WABC) -- A New Jersey couple who faced a life-changing loss finally has some well-deserved luck. 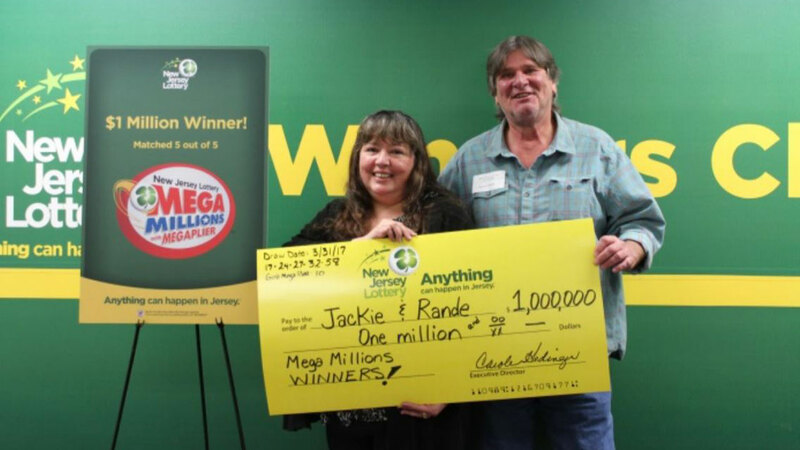 Long Branch residents Jackie and Rande, identified only by their first names, won the Mega Millions $1 million second-tier prize on March 31 when their ticket matched all five of the white balls drawn. The win comes after the couple, married for 17 years, faced a fair share of challenges -- the most devastating being the loss of their daughter to Lupus. Since her death, Jackie and Rande started raising their three young grandchildren. "They are the most deserving people in New Jersey," their friend Debbie said. "They have helped so many other people in their times of need, and now it is their turn to receive this very necessary blessing." The grandparents will use their prize to pay off immediate bills first, and the rest will go toward their grandchildren. "I am just very grateful," Rande said. "This will help our lives out a lot." Jackie's eyes were filled with tears as she received her check. "This will be the beginning of good fortune to our family," she said. The couple bought their winning ticket at Long Branch Convenience.